IT HAS ARRIVED, it has arrived!!! After over two weeks in transit, the package has finally arrived in northern Sweden. The recipient is called Elizabeth, or lizziebird as she is known on Flickr. When I got the email revealing my Swap Partner, one of the things which immediately caught my eye, was that she "had a thing for hedgehogs and Totoro". 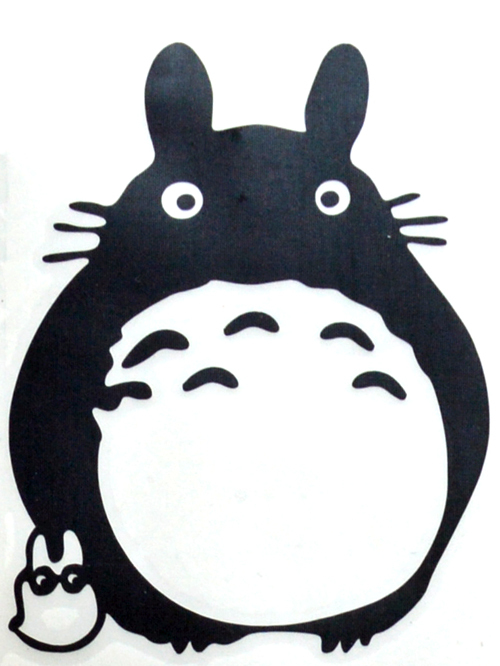 I didn't have a clue who Totoro was, but with the help of Google I soon found out. He's an incredibly sweet animated Japanese character. 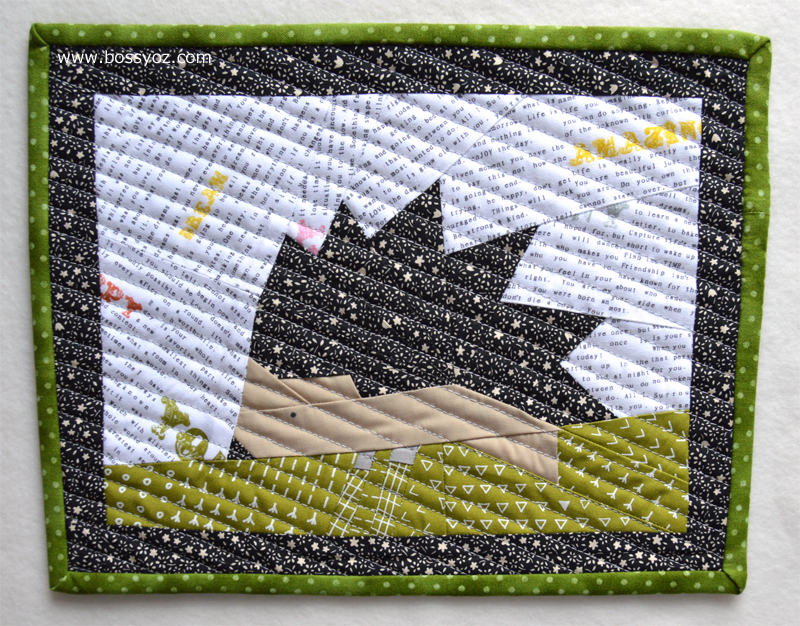 My first plan was to make a Totoro mini quilt, but checking her Flickr feed, I realised someone else had beaten me to it. Instead I settled for a car / window sticker. 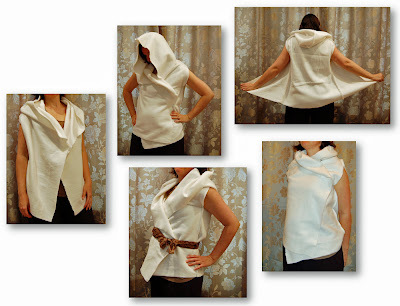 For the hedgehog I came across a fantastic paper piecing template on Artisania's homepage. I had never done any paper piecing before, but with an engineer's logic I set off and made a trial version. After realising I needed to trim and press (a lot) more often, I dug out the nice fabrics. Some of these are from Karen at Blueberry Park and I had seen my partner liking her fabrics on Instagram. For my second go at paper piecing I am pretty pleased with how it turned out. With most of the extras sorted, I still hadn't decided on the 'proper' mini itself. The hedgehog was too small to be the main thing, so I really needed to come up with something more. Checking through her Flickr profile I spotted quite a few projects from the book "Patchwork Please" with plenty of inspirational zakka projects. The envelopes caught my eye as she had a few of them in her feed. 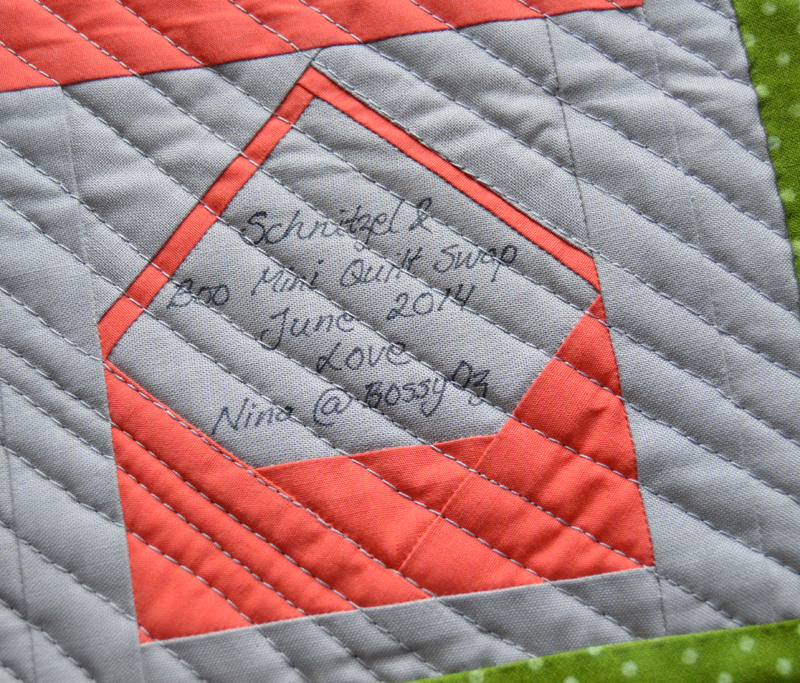 Oups, another paper piecing project! Oh well, if I could make the hedgehog, I should be able to do the envelopes, right? 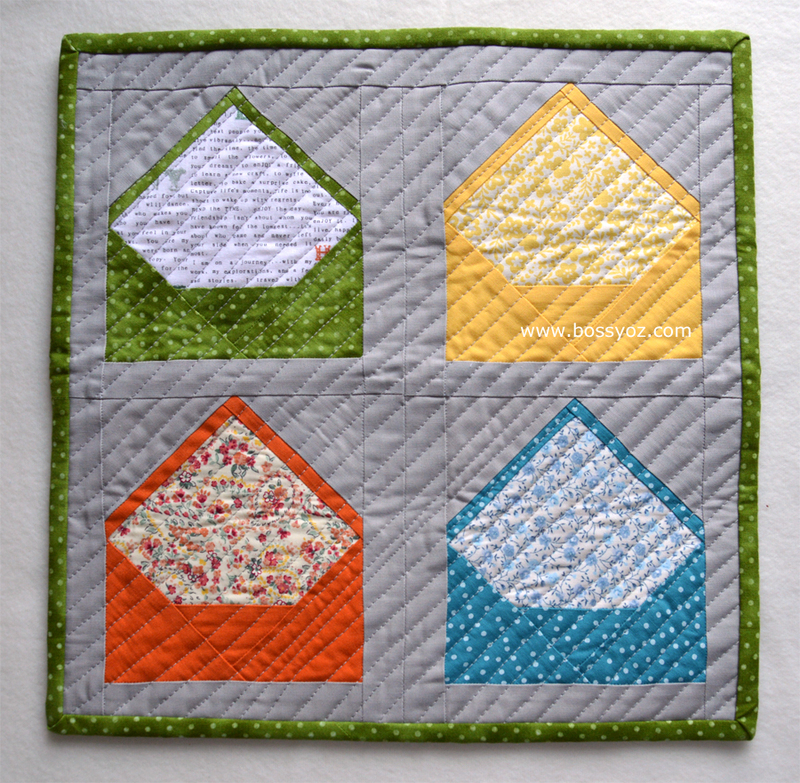 Actually, this was much easier as there was a step by step tutorial in Love Patchwork & Quilting, issue 7. 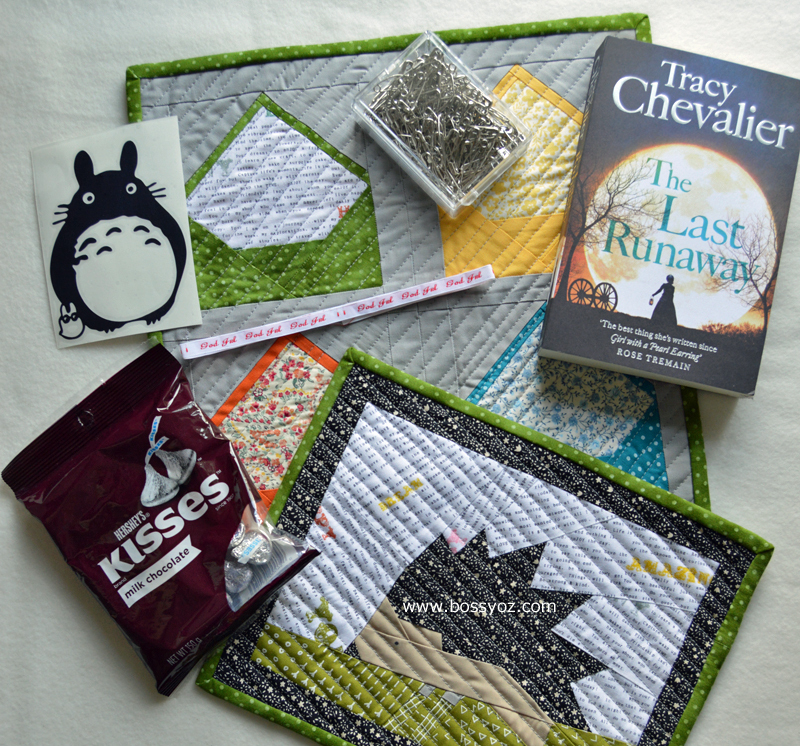 The extras included: Totoro window / car sticker, curved quilting safety pins, The last Runaway about a quilter in the United States (my partner's home country) and written by the author or The Girl with the Pearl Earring, Hersey chocolates, the hedgehog minimini / mug rug, bike fabric and some Merry Christmas (in Swedish) labels. And finally the card, from Stonehenge, a place I have visited more times than I care to remember. Thank you so much for allowing me to be your Swap Partner and getting to know you a little bit during these weeks. Thank you also for all the lovely photos from my home country! I had no idea you hadn't paper pieced before, as the workmanship is lovely. So are the fabric choices. I owe you a real letter and will be sending one shortly. Thanks again for a lovely and thoughtful package. I sewed on hangers and will soon have these babies on the wall! 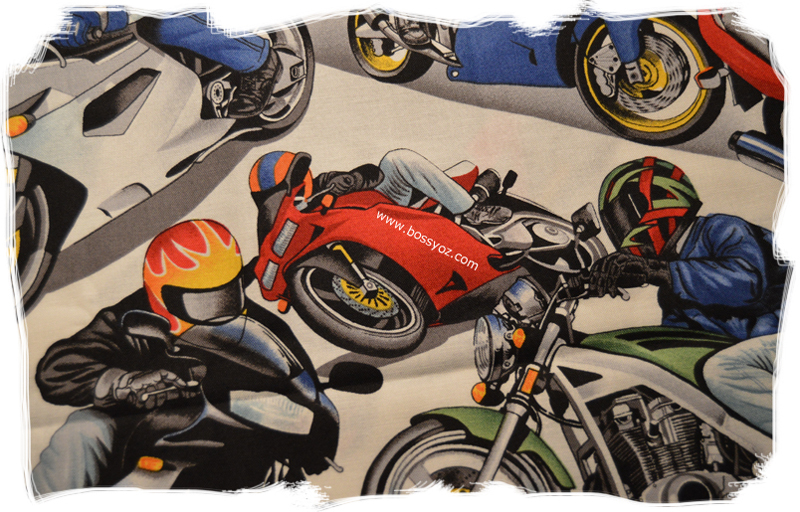 Looking for sports bike fabric and saw this. Where can I get that same print by the yard? Lisa, the bike fabric is by Alexander Henry, but out of print for quite a long time. I came across it in a destash on Instagram. How much are you looking for? Lisa, I have 50 cm / 20" which I haven't used yet. Where in the world are you? Postage might be a killer. 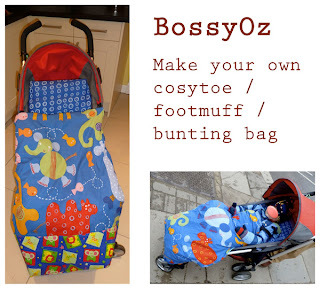 Send me an email or DM on Instagram (bossyoz) and let's see if we can work something out.